Rock phosphate has traditionally been used to produce phosphate fertilizers, but its reserve may be depleted in 50–100 years. Excessive application of P fertilizer is often used on horticultural crops. It is necessary to implement horticultural management practices that reduce P application and increase P use efficiency. Growth improvement of horticultural crops following inoculation of AM fungi has mostly been demonstrated under pot culture conditions and although most horticultural plants form mycorrhizas, the extent to which they do so under commercial conditions depends on fertilizer use strategies. 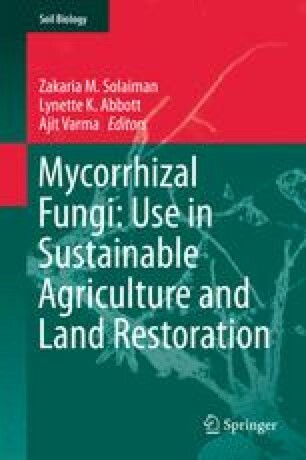 Furthermore, mycorrhizal dependency differs among horticultural plant species and cultivars and consistent responses to inoculation with AM fungi under field conditions have not been clearly demonstrated. Most field experiments investigating the potential effectiveness of AM fungi have been carried out at only one P level and the population dynamics and characteristics of indigenous AM fungi, which can influence plant growth response to introduced AM fungi, have not been fully considered.